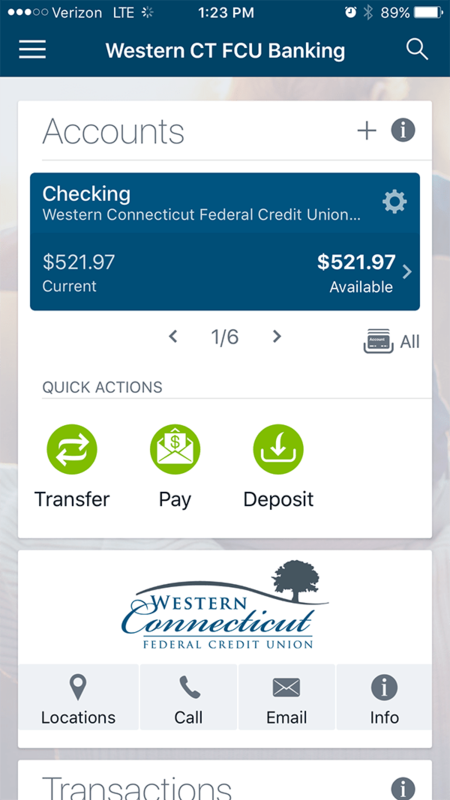 Access your accounts at Western Connecticut Federal Credit Union on your mobile device anytime with our Mobile Banking App! Use it to check your balances, view your transaction history, transfer money, pay your bills and deposit checks. Our NEW Mobile Check Deposit feature allows you to snap a picture using your phone of the check you want to deposit. It’s super easy and super convenient! Give it a try, we are sure you will love it! Before using the Mobile Banking App you will need to have a login and password established along with three security questions for the Online Banking service. This initial setup does need to be performed using a regular web browser from a desktop or laptop computer. The Mobile Banking App will prompt you for this information during setup and as required you may periodically need to enter updated information. Call us at 203-791-9399 with any questions, we are happy to help! Western Connecticut Federal Credit Union’s mobile banking app is protected with SSL encryption, the same security protection used when logging into online banking from a web browser on a computer. Password and security questions are required to login and there is a time-out period for inactivity. If your mobile device becomes lost or stolen, you can quickly deactivate access to your account by logging into online banking using a computer and changing your password. You may also contact us during normal business hours at 203-791-9399 to change your password. Click here to read more and download the Android app. Click here to read more and download the iPhone app. You must be a current Western Connecticut Federal Credit Union member and signed up as an active user of our Online Banking. Before you can begin paying bills with your mobile device, you must be a registered user of our Online Bill Pay service. To sign up for online banking contact the credit union at 203-791-9399 and then complete the initial login process using a web browser. Once you have gained access to your account through online banking, sign up for Online Bill Pay. While the Mobile Banking app is free to install, your mobile provider may assess web access charges.